The show comprises quality vetted stock for all tastes and pockets from 18th to 21st century. Periodically we put items to sell on eBay. Sometimes we will offer them under the auction format in which case we will not end the auction early as this would be unfair to people waiting until the end of the auction to bid. However, sometimes we will put them on with a “Buy it Now” option. In these cases please feel free to contact us and purchase them directly. By doing this you will be able to buy them at a discount to the eBay price as we will not have to pay the eBay commission. Save even more money by paying us by bank transfer or UK cheque. We want you to be able to enjoy our goods at the cheapest possible price without us having to factor in a profit for anybody else. Finally the new website is up and running. Thank you everyone for being so patient and for not giving up on us. That’s the problem with having to manage a website and attend to all the other aspects of running a business. Finding time to sit at the computer and input all the information always seems to get pushed to the back of the queue. Anyway, I am sure that you will find the new website easier to use and appreciate the new features. Each stock item now has additional close-up images of details or different angles, although I am always happy to send more if they are needed. We also now have a search tool so you can look specifically for your field of interest if you don’t feel like browsing the various categories. I will also be posting a regular blog to keep you all updated with new finds and news about our movements and shows at which we will be exhibiting. We now exhibit 3 times a year at the Antiques For Everyone show at the N.E.C in Birmingham. Next show 17-22 July. Come and see us on stand L17. Email me and I will be happy to send you complimentary tickets (usual price £15 on the door or £12 in advance). We are also planning on doing one of the London shows in the near future although we have not settled quite which one yet. For those of you in the USA we are hoping to exhibit at the Miami Beach Antiques Show in January 2013. Watch this space for more details! The technological upheaval of the Industrial Revolution had transformed Victorian Britain from a largely agrarian and rural society into a country with many urban conurbations and workers often enduring terrible conditions and mindless repetitive work. From the 1850’s John Ruskin had championed the plight of the worker and denounced British society as being based on a greed that created misery in inverse proportion. He advocated raising the lot of the working class and thus society in general through education and development of the individual. He greatly admired medieval society, which he believed was based on craft, artisanship, dignity in labour and the freedom to express one’s individuality. In 1871 in an ambitious attempt to bring about social reform and the destruction of industrialism Ruskin helped establish the Guild of St. George. The aim was to create a society based on medieval feudalism with craftsmanship and quality of life at the core. With a donation of £7,000 from Ruskin to set it up, the Guild hoped to be part funded by donation but sadly only received a total of £236 over the next three years. The experiment was short lived and left little concrete by way of legacy. Whilst at Oxford University William Morris had become close friends with the artist and co founder of the Pre-Raphaelite Brotherhood, Edward Burne-Jones. The influence of Ruskin’s writing, their love for medieval arts and crafts and their Anglican beliefs led to what they felt was a crusade against the art and culture of their time. In 1857 with the help of Dante Gabriel Rossetti they were commissioned to paint murals for the walls of the Oxford Union Library. Although this was only a limited success (only seven out of ten were completed and due to poor preparation the colours started fading within a matter of months) it perhaps paved the way for what was to be probably the most important development for the Arts & Crafts movement in Britain. Morris, Marshall, Faulkner & Co was established in 1861 and set with the ideal of bringing high quality interior decoration and fittings to the British populace at large. Initially there were seven partners, the other four being Ford Madox Brown, Charles Faulkner, P. P. Marshall and Philip Webb but by 1874, after varying financial success, it had become simply Morris & Co. The emphasis was on hand crafted design and aimed to draw the populace away from shoddily, industrially made ill conceived and over ornamented design. Morris was keen to promote the concept of art moving hand in hand with utility. Products should have no more decoration than their nature demanded and should have a broad and popular appeal. Ironically the high production costs involved in providing a product that was both well designed and hand crafted necessitated a wealthy bourgeois clientele and Morris never was to achieve his Utopian vision of art and design in tune with nature and with a social conscience. However he did help create an ethos in which the many workers guilds, evening school classes and socially based craft projects that sprang up in the 1880s and 1890s could thrive. The increased knowledge and appreciation of medieval artisanship and the realisation that industry was submerging the working man and fragmenting society, permeated the middle classes and led to some interesting social and artistic experiments. Also inspired by the socialist writings of John Ruskin, The Guild of Handicraft was established by Charles Robert Ashbee in the impoverished East End of London in 1888. It had started as a Ruskin reading class but graduated into an art and craft class and by 1887 had become the School of Handicraft. The principle of pupils being trained by craftsmen then graduating into the workshops led to the foundation of the Guild of Handicraft in 1888. In 1890 the Guild moved into it’s own premises still in the East End where it was to remain for 12 years. In 1898 after the death of William Morris, Ashbee acquired the Kelmscott Press near Lechlade in Gloucestershire and continued to run it under the name of the Essex House Press. The Cotswolds already had associations with the Arts & Crafts movement with Ernest and Sidney Barnsley and Ernest Gimson working in the area and in 1902 driven by the desire to create a workers community the Guild uprooted itself to Chipping Camden. The move was ambitious and although being closer to Ashbee’s socialist ideals it put a great financial burden on the Guild. In order to promote sales a retail outlet was kept in London. The combination of high running costs and Ashbee’s laudable insistence on maintaining a high quality handcrafted product inevitably took its toll and in 1908 the Guild went into liquidation. The Guild had a wide and varied production including jewellery, woodwork and furniture made to Ashbee and Baillie Scott designs but it is perhaps the beaten metal that they are best remembered for. Ashbee’s work is distinctive and has a strong identity, elegant forms often embellished with flowing wire work, semi-precious stones and enamel work. Much of the output was produced in silver and silver plate but brass and copper were also used. The emphasis was on hand working with no attempt to remove hammer marks and actually using them as a decorative feature. Although the venture had been a financial failure it did leave behind a legacy and many of the workers carried on working independently. It also spawned several prominent designers and craftsmen who were highly influential in their own right and who helped teach in some of the craft schools. John Pearson, one of the founder members of the Guild and one of the first metalwork instructors, went on to teach at Newlyn and then to open his own workshop and to produce for Liberty & Co. John Williams, another early member of the Guild, helped in an advisory capacity at the Fivemiletown metalwork classes in County Tyrone in Ireland and at the Newton class in Cambridge. As the nineteenth century was drawing to a close the fishing village of Newlyn in Cornwall was set to become one of the major centres for hand crafted metal. Since the 1880’s with its rugged beauty the village had become an important community for artists with a common interest in “plein air” painting. In 1884 Stanhope Forbes moved to Newlyn and soon was seen as a leader of the group. Attracted not just to the surrounding scenery their work also embraced a sort of social realism and focused largely on the working community. It was perhaps this interest and affinity to the working man that led the artist JD Mackenzie to establish the Newlyn Industrial class. Initially it was seen as a means of occupying the weather-dependant fishermen in times of idleness and a range of skills including woodworking and embroidery were taught. As an area rich in natural deposits of copper it seemed inevitable and fitting that this would become the main focus of the class. With the arrival of John Pearson in 1892 came the expertise that was to ensure the class’s longevity. Pearson was already regarded as a leading craftsman designer and had taught in the metalwork department at the Guild of Handicrafts until his dismissal in that year. Unsurprisingly, the majority of the classes output drew upon the subject matter that was most familiar to them. Aquatic scenes of fish, seaweed and a variety of marine life were hand beaten into sheet copper and raised or formed to produce decorative but also useful objects. Fruits such as apples and oranges were also a common theme. The bulk of their output consisted of everyday items such as bowls, dishes, trays, candlesticks, jugs, caddies and boxes but great attention was given to the quality of the production. The copper used was of a good heavy gauge and always well finished. Seams were riveted and usually the marks of the hammer blows are clearly visible making decorative elements out of the means of construction. Initially the wares were retailed through the Newlyn Art Gallery but with Pearson’s London connections it was not long before it was also retailed through Liberty & Co. Although unclear, it is thought that Pearson worked with the Newlyn class for about 7 years. Mackenzie remained an able and energetic director there until the First World War and in addition to the copper production also oversaw brass, pewter and silver work including jewellery and enamel. At around the same time in the North of England, Canon Hardwicke and Edith Rawnsley were establishing classes in repousse metal work, spinning, weaving and wood carving in Keswick, Cumbria. The Keswick School of Industrial Arts, like the Newlyn workshop, was deeply rooted in the tenets of the medieval guilds and a philanthropic belief that the life of working people could be improved through craft. As it had been mined in Keswick during the reign of Elizabeth I, copper was a natural choice of material although silver, brass and later stainless steel were also commonly used. Initially the classes were held in local parish rooms and taken by Edith but as the classes grew in size workshops were specifically built and the help of outside expertise was enlisted. This included Arthur Simpson and Harold Stabler who was head of design for two years from 1898. A large part of the Schools output consisted of pieces made by the pupils to the designs of the tutors. Although less stylised than the work from Newlyn, metalware from Keswick is nonetheless distinctive. Influences included Norse art, Iznic and Renaissance designs and a panoply of subjects after the antique. This was fuelled in no small way by the Keswick museum, which supplied much loan-material to the school as study material. Students were also encouraged to develop their own work and designs that had to be passed by committee before being produced. In an effort to make the School financially self-sufficient work produced was sold but only if it had reached a certain standard and had passed the scrutiny of the board. Student work of a high enough quality was awarded the KSIA stamp but as the school expanded they eventually took on full time craftsmen to make the venture more viable. As at Newlyn the product was mainly utilitarian – trays, bowls, vases, jugs, candlesticks etc, although special commissions were also undertaken. Although the school’s role as an educator and an aid to the community had always been paramount, commercial concerns came more to the fore. An effort was made to separate the two elements in order to protect the educational side but the reality was that the school also needed to be a financial success. Adapting to changing markets and recognising that the Arts & Crafts movement had had its day the production changed quite radically in the early 1930’s. Heals in London had undertaken to retail KSIA work on the condition it was produced in the more voguish stainless steel. By 1933 stainless steel accounted for over half of the schools production. 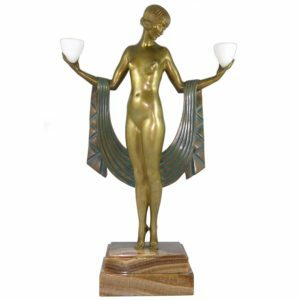 Due to the less malleable nature of the material and the taste for Art Deco, designs tended to become more simplified and less ornate. Though the school underwent many evolutions and changes to remain viable, over the next few decades it started to lose the battle against machine produced stainless steel and in 1984, it’s centenary year, financial crisis finally forced the School to close down. Established along the same lines as Ashbee’s Guild of Handicrafts and inspired by Ruskin and Morris, it had grown out of the Birmingham Kyrle Society, a philanthropic organisation aiming to add refinement to working people’s lives. Originally crafts were only an element of the Society’s agenda but in 1890 the Birmingham Guild of Handicrafts was formed to concentrate on this aspect and develop it. In 1895 the Guild disassociated itself from the Kyrle Society and became a self-supporting co-operative workshop and a limited company. Whilst realising the need for financial viability the Guild was still dedicated to producing high quality, handmade articles and keeping the welfare of the craftsmen in mind. The greatest part of their output was from the metalware workshop but they also produced furniture, books and a quarterly magazine called The Quest. The chief designer and head of the metal workshop was Arthur Dixon but other associates included A E Jones and Thomas Birkett. The Artificers’ Guild was founded in 1901 by Nelson Dawson from his workshop in Chiswick but was acquired by Montague Fordham (one time director of the Birmingham Guild of Handicrafts) in 1903. He transferred the Guild to his gallery in Maddox Street and Edward Spencer became chief designer. Influenced quite heavily by John Paul Cooper, who was already working for Fordham, Spencer established a distinctive in-house style that was to remain with the Guild until their demise in 1942. They produced mainly decorative metalware and jewellery in silver, ivory and semi-precious stones but also did work in copper and brass, often silver-plated. Walter Gilbert, cousin of the sculptor Alfred Gilbert, established the Bromsgrove Guild of Applied Arts in 1890. The Guild originally had no workshops of its own and was a loose amalgamation of artist craftsmen not all of whom lived in the Birmingham/Bromsgrove area. Mostly working to commission and employing artists when and as they were needed, their ranks included Arthur and Georgie Gaskin and Joseph Hodel. Besides interior commissions they were most noted for metalwork and jewellery. In the same vein as the Keswick and Newlyn evening schools, a metal work class was established in 1890 in Yattendon, Berkshire. Mrs Waterhouse (wife of the Quaker architect Alfred Waterhouse who amongst other commissions designed the Natural History Museum) was instigator and benefactor paying for materials used and being responsible for the majority of the designs. Most of their output was copper although some early work was also done in brass. Some of their wares were sold through Liberty & Co in London until the class was disbanded in 1914. The Duchess of Sutherland’s Cripples Guild mainly produced hand beaten copper ware, sometimes silver-plated and usually of a simple design. A small metal working class set up in County Tyrone Ireland led by Mrs Montgomery. The school was visited by John Williams (Guild of Handicrafts) in the mid 1890’s during which time he helped in an advisory capacity and provided them with some designs. Set up in Cambridgeshire. Like the Fivemiletown group, it received advice from John Williams. Neither a Guild nor a School but worthy of mention for adopting the ethos of hand-finished art copper. Hayle copper was produced by the company J & F Poole of Copperhouse in Hayle, Cornwall. Their output was a combination of machine and hand production. The piece was initially die-stamped on a zinc mould and then hand finished to give it a crafted look. The amount of hand finishing was variable and consequently there is a marked difference between a highly worked piece and one that is less so. Although the better pieces exhibit good craftsmanship they seldom equal the quality of Newlyn copper. Subject matter and range was similar to that of Newlyn although Glasgow School motifs such as the Mackintosh rose were also favoured. This is by no means an exhaustive list of the many Guilds and Schools that helped popularise the aesthetic and ethos of the Arts & Crafts movement. The Glasgow School of Art played a major part in developing Britain’s reputation world-wide as one of the creative and innovative leaders in Applied Arts at the turn of the twentieth century. So important was the Glasgow Style that this will be the subject of its own article at a later date. There were also many other groups throughout the UK who either were too short lived or who never gained such commercial or artistic success. Information on many of these is scarce and further research needs to be done. The fortunes and successes of the individual Guilds and Schools were varied but as a whole their importance cannot be overestimated. They helped shape the artistic and, to some extent, the social zeitgeist of a whole generation. They firmly closed a chapter in the history of British design, breaking away sharply from the excesses of Victorian design and creating a design ethic where the suitability of material, fitness for use and an elegance of line were paramount. In short they helped create the framework for good modern design.